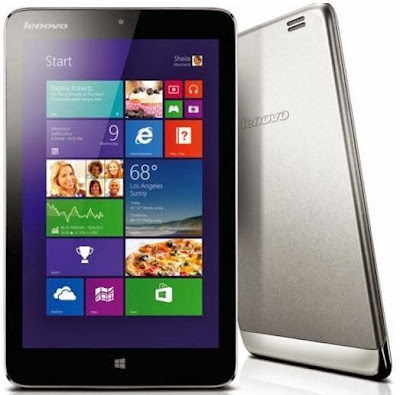 Lenovo has announced a company’s latest 8 inches tablet named Lenovo Miix2 with Windows 8.1 OS in the Indian market. The expected price of Lenovo Miix2 Tab is around Rs.18,348. Lenovo Miix2 Tablet sports with a 8 inches Capacitive Touchscreen display with a screen resolution of 1280x800 Pixels.The tab is chipped with a 1.8GHz quadcore Intel Atom processor with 2GB of RAM. It runs on Windows 8.1 OS.The dimensions of Lenovo Miix2 Tab are 215 x 132 x 8 mm and it weighs 350g. The tab comes with 5.0 Megapixel camera at rear and 2 Megapixel front facing camera for video calling.Lenovo Miix2 Tab comes with 128GB of eMMC onboard storage / 32GB / 64GB internal storage which is expanded up to 32GB via microSD card. The connectivity features of Lenovo Miix2 Tab are Wi-Fi, Bluetooth, Micro-USB, 3.5mm audio jack.The battery capacity is loaded with 2-cell lithium-ion.